Stephen Baird started winning National titles as a junior and didn’t stop. The son of Charles F. Baird, who was inducted into the Hall of Fame in 1992, Stephen partnered with younger brother Chip to win back-to-back Junior titles before his age made him ineligible. 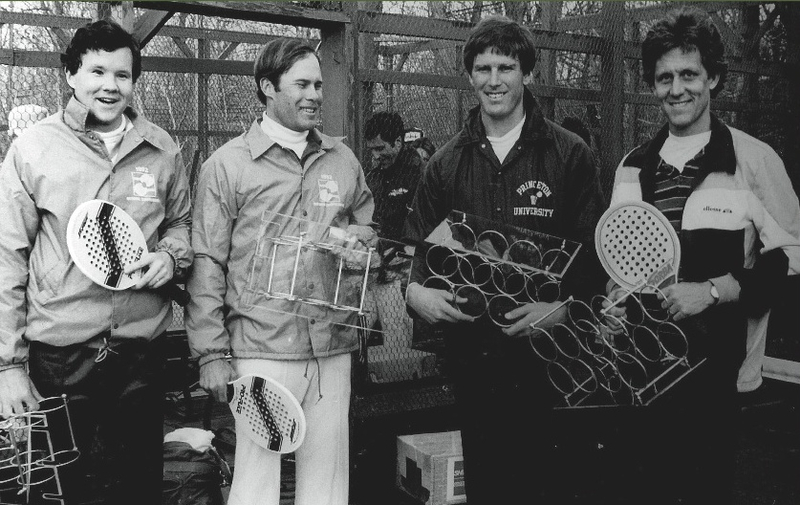 The two paired up again for the Men's Nationals starting in in 1973 and won their first Men’s title in 1976, becoming the youngest team to do so. When health issues forced Chip to stop playing in 1979, a dynasty was born when Steve began to partner with Rich Maier. Starting with that 1979 finalist spot and ending 13 years later, in 1991, Steve went on to be a finalist every year, winning ten and coming in second in the other three. During this span, he twice won four titles in a row. No player has won more Men's titles. 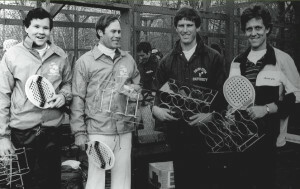 Baird was a four-sport letterman in high school and the captain and star player on the tennis team at Bucknell, amassing a record of 25 wins against one loss and capturing a conference singles championship. He matriculated to paddle because his father and brother played the game. At the beginning, it was kind of an add-on for him but, very early on, he showed a natural affinity for the game and appeared destined to accomplish great things. 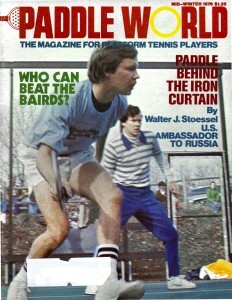 The first time Baird played paddle competitively was in the APTA Junior Nationals in 1969. At that time, he had only two years of eligibility, but he and Chip won both times (1969 and 1970). 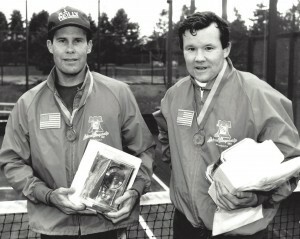 They played in their first National Men’s Doubles in 1973 and had a good enough record to achieve a #4 national ranking. 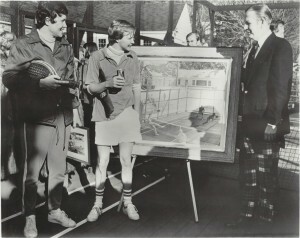 They won in 1976, defeating defending champions, Keith Jennings and Chauncy Steele, and losing only three sets along the way. 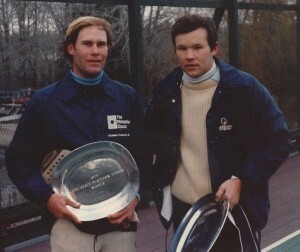 With this win, they became the youngest players to-date—Steve was 25, and Chip, 22—to win the Nationals.. 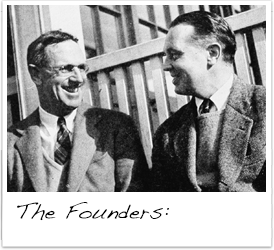 They continued playing together during an era when Herb Fitz Gibbon, Hank Irvine, Clark Graebner and Doug Russell were dominating play. Despite the competition, they were finalists in 1979. In 1980, when Chip retired, Steve forged a partnership with Rich Maier never equaled before or since. No player has won more Men’s Nationals and, in the history of our game, only one other team, Flip Goodspeed and Scott Mansager, has won more than four in a row (1996 – 2000) and no team has ever one four in a row twice (1980-1983 and 1988-1991) during years where there was some heady competition from tennis players turned paddle players. 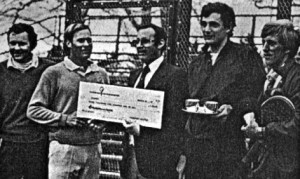 The dossiers of the opposition included two teaching professionals, three Davis Cup players, a team ranked #10 in U.S. tennis doubles, a player ranked #3 in U.S. Tennis Doubles, a player on the professional tour and one on the satellite tour. At the core of what Steve did on the court was his athleticism. He could do amazing things with that unforgiving, perforated racket. The shots this deuce court player was best known for were his forehand return of serve and his lashing forehand drive off the screen. Virtually all of his shots were placements and hit at a constantly changing pace. It was the surprise factor—of not knowing what he would do—that challenged opponents. Watching Steve play was marvelous fun. Steve’s approach to competition was identifying and understanding the pattern of play that won that team points, and then recreating the patterns that led to his team’s strengths. He always played as a team, making his partner better by fitting their games together. He knew that it was the combination of skills that made a great team. And this, unquestionably, was a great team. The other important side of this paddle player was what he did off the court. 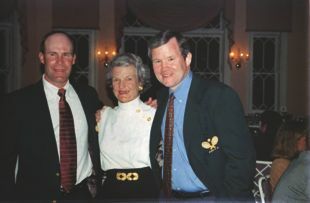 He was on the Board of the APTA for six years and President for two, taking the helm at a difficult time for the sport. 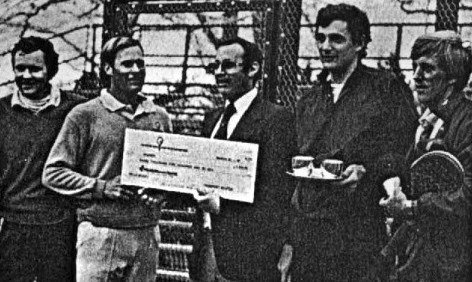 Platform tennis was still commercially-focused but, as sponsors lost interest, there was a need to change the focus to keep the sport and the organization healthy. He pushed for more tournament levels with more competition for the average player—a considerable perspective for a champion who had never really known what it was like to be average. 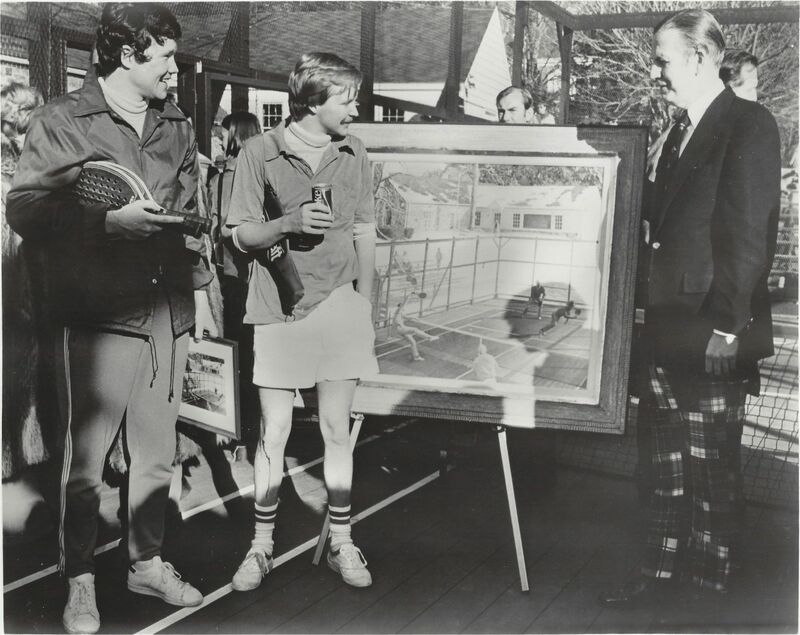 The Baird brothers capture the 1976 Men's Nationals and are presented with a copy of the iconic Sticker pairing commissioned by Coca Cola Bottling Company of New York. 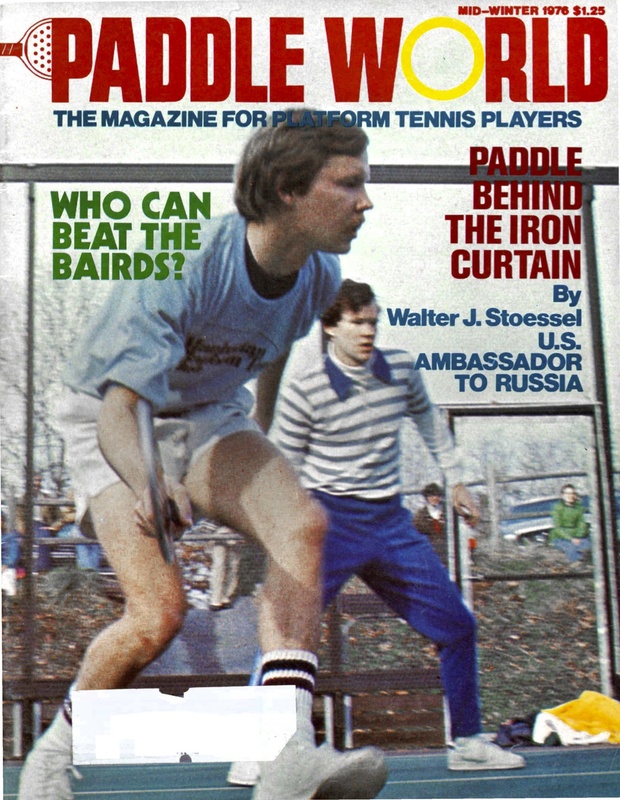 The Bairds were finalists in 1979.
Who can beat the Bairds?